A group of talented engineers at the MIT's Computer Science and AI Laboratory (CSAIL) have developed a new kind of drone that can fly and drive anywhere. The behavior of the drone is inspired by insects and birds that do both, naturally. Typically, the drones are meant to fly and they do not have a long range on the ground. If there was a way to make the drones capable of flying and driving with greater efficiency, it could open up plenty of opportunities in the area of transport. That's exactly what motivated the researchers at MIT-CSAIL. 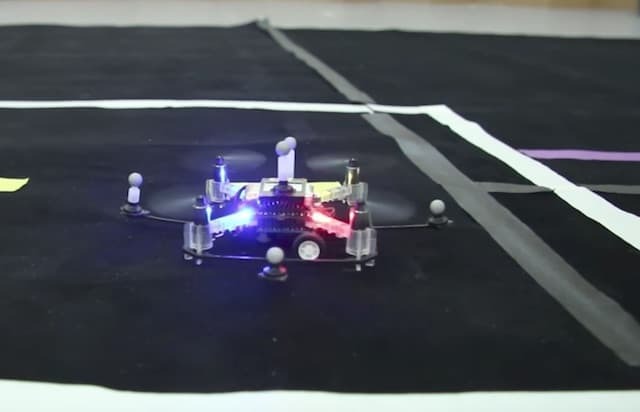 The team is aiming to develop robotic drones that can be maneuvered both in air and on the land. These special drones will be incredibly helpful in disaster struck areas and even construction areas. The team presented their research on drones that can fly through a city-like setup with parking lots, no-fly zones and landing pads. PhD student at CSAIL Brandon Araki who led the research said that the ability to fly and drive is very useful in challenging environments. Araki worked along with CSAIL Director Daniela Rus and a team of undergraduate students to develop the system. You may see it in action in the following video. The project is inspired by Araki's previous project - a flying monkey robot. It could crawl and hop over the obstacles. However it failed to travel autonomously. Araki wanted to address this problem. The solution was to define a path-planning algorithm that ensured that there were no collisions among the drones. Each drone would follow its set path. Two controlled motors at the bottom of the drone would allow it to travel on the land. The team found out that these tiny drones could fly for about 90 meters and drive for about 252 meters before the power in the batteries drained out. It's quite impressive, given the size of the drones. The driving component resulted into the loss of flying time of the drones by about 14% ( ~ 300 ft). Jingjin Yu, a CS professor at Rutgers University who was involved in the project said that this works will offer insight into development of solution for a large-scale, mixed-mode transportation. The test setup comprised of roads built using fabric and small homes built using cardboards. There were about eight drones that were set on predefined path to avoid collisions. The team hopes that their research will be helpful in developing control algorithms for the flying machines. There are several bigger challenges involved in adopting the system for human transportation.